Come on out for an evening of inspiring student performances from rising star vocalists in the Jazzschool Institute degree program. Under the direction of Laurie Antonioli, vocalists enrolled in this eight-semester course cover a range of styles, from the Great American Songbook to bebop, modal, world, pop, and free music. Students compose original material, write their own lyrics, and create their own arrangements. 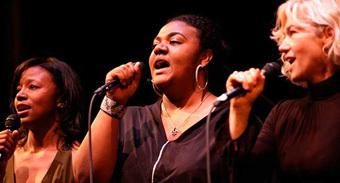 Accompanied by a rhythm section, singers focus on interpretation, stage presence, improvisation, vocal technique, and phrasing, as well as cultivating their own personal style. Tonight’s program features Kathy Blackburn, Thea Rose Cristman, Cynthia d’Anna, Kyra Gordon, Rick Gordon, Joann Im, Swami Iyer, Natalie Marshall, and Susana Pineda. The all-star back-up band includes Matt Clark on piano, John Wiitala on bass, and Bryan Bowman on drums. Support your local jazz musicians and catch these rising stars on the way up!